"Thanks for coming to my rescue again! You guys always get to me fast." 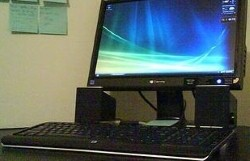 Intel Dual Core, 2GB DDR2, 160GB HD, DVD+-RW. We at Geeks On-site specialize in Maryland virus spyware removal service in Maryland MD. We also offer in home virus spyware removal and in office virus spyware removal services. Please call us to get a FREE PHONE CONSULTATION and ESTIMATE. Chances are, wherever you are in Maryland, you're usually online. Whether you're processing payments on a desktop at a doctor's office in Columbia, finishing a paper on your laptop before class at John Hopkins in Baltimore or Facebooking on your tablet as you commute into Washington D.C, you're probably connected. Your computer is your livelihood. It's also your connection to friends and family. And when your files get corrupted by a virus, you need help fast. For efficient and effective virus and spyware removal, Maryland residents turn to the experts at locally owned Geeks On-site. If you have a Mac that has been infected by Trojan Flashback or other viruses, don't worry. We perform virus removal on Macs and PCs of every age and size. Over the last seven years, our expert technicians have worked with every model you can think of, so no matter what operating system you're using, we can tackle your virus removal needs. There is no problem too big or too small for our technicians. If you have an office full of corrupted computers, call Geeks On-site and we'll figure out the best way to help. We're also available to remove spyware from your personal laptop too. With Geeks On-Site, maryland virus removal comes to you. Just give us a call and after a quick consultation we'll send a technician to your door that same day if convenient. We have served the state of Maryland for years, so we'll be able to find you in the bustling streets of Baltimore or the remotest corner of Howard County. If you need immediate maryland spyware removal or virus removal, call one of our experts at Geeks On-site for a consultation. We can help you remove a single virus or spyware infection or thousands of infections. Virus and/or Spyware infections are the most common computer problem and we have helped thousands of our customers clean their computers. In some cases the infection can be cleaned up with a few tweaks in 15 minutes and in the worst case scenario we can backup your data and wipe your system completely clean. We offer trojan virus removal, worm virus removal, adware virus removal, malware virus removal, spyware removal, pc virus removal, windows xp virus removal, windows vista virus removal, and computer virus repair. Geeks On-site offers the absolute best Maryland virus spyware removal service in Maryland MD. We also offer in office virus spyware removal and in home virus spyware removal services.